Hurricane Katrina was the costliest and one of the five deadliest hurricanes to ever strike the United States. 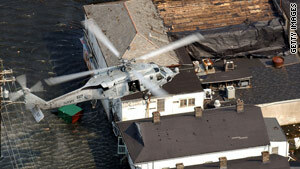 Washington (CNN) -- Just five days before the fifth anniversary of Hurricane Katrina's devastating assault on the Gulf coast, millions of dollars are heading to public and private projects for Louisianans still trying to recover, two top Obama administration officials said at a news conference Tuesday. Department of Homeland Security (DHS) Secretary Janet Napolitano and Federal Emergency Management Agency Administrator Craig Fugate detailed how, courtesy of the federal disaster recovery fund established under the Stafford Act, seven projects in Louisiana will receive more than $26.8 million to contribute to the rebuilding process. In a statement released later Tuesday by the DHS, a grant of more than $1.6 million to a Mississippi project was added to the list. The latest projects are in addition to about $2.5 billion in funds the Obama administration has given to the region for renewal since President Barack Obama took office in January 2009, Napolitano said. "Over the past 20 months, this administration has cut bureaucratic red tape that had slowed recovery and expedited assistance across the Gulf Coast," Napolitano said in a statement. "We will continue to work with our federal, state and local, private sector, faith-based and nonprofit partners, as well as Gulf Coast residents, to ensure local communities have the assistance they need to rebuild the region stronger than ever." Fugate said the Jefferson Parish funding was related to damage from Hurricane Rita, rather than Katrina. Hurricane Katrina made landfall on the Louisiana coast on August 29, 2005. It was the costliest and one of the five deadliest hurricanes to ever strike the United States, according to the National Hurricane Center. "Considering the scope of its impacts, Katrina was one of the most devastating natural disasters in United States history," the hurricane center says. Hurricane Rita made landfall less than a month later, on September 24, in extreme southwestern Louisiana near the Texas border, producing significant storm surge that devastated coastal communities in southwestern Louisiana, according to the hurricane center.